You are currently browsing the category archive for the ‘Health Disparities’ category. The border between Haiti and the Dominican Republic. 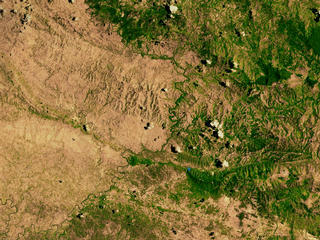 Haiti is to the left and the Dominican Republic is the greener area to the right (source: NASA). 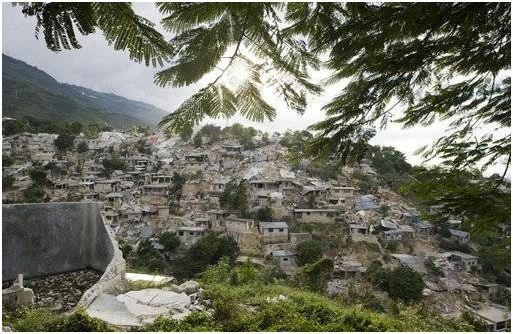 Now, with the worst earthquake shaking the Caribbean in 200 years, we must sadly add another chapter to the Haitian book chronicling the linkage between its human and ecological disasters. Without significant domestic lumber sources or the resources to import replacements, much of the Haitian housing consists (or “consisted” in the areas hardest hit) of unreinforced or poorly reinforced concrete and concrete blocks of varyng quality. As can be seen by the utter devastation in the numerous aerial surveys and neighbourhood panoramas posted over the Internet, those type of structures fare much worse than that of wood frame housing known to perform well in earthquakes from a human safety perspective. Thus, the Haitians share all too much in common with the experience of the Easter Islanders ecocidal slide into oblivion discussed by Jared Diamond. [viii] Had the Haitian forest environment been managed differently they might have been able to build their homes out of wood and the human suffering from this rare but predictable earthquake would arguably not have been as great. With the help of massive embodied energy in the food and disaster response resources imported from generous international humanitarian efforts, some of the longer term devastation and loss of life from this event will be averted or postponed. But one can’t help but shudder at the possibility of an entire world so constrained by energy/economic decline induced transport constraints where no help will arrive in time, if at all, in inevitable future earthquake and other natural and man-made disasters. Collapse may be slow and sometimes imperceptible by the current generation, as both Diamond and Greer[ix] eloquently discuss, but sometimes nature’s fury, compounded by mankind’s short-sightedness and foibles, wreaks havoc and death in a heartbeat.